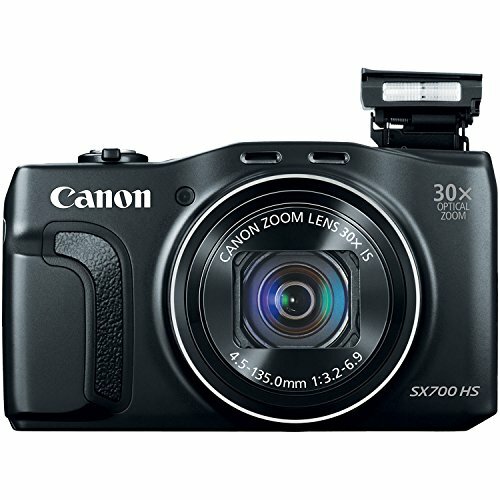 The Canon Power Shot SX700 HS digital camera features a powerful 30x optical zoom that lets you get right down onto the field to preserve a big play, reach deep into the forest for spectacular wildlife close-ups, and capture majestic architecture just the way you see it. What's more, the camera's advanced technology ensures truly impressive quality in every shot, even at the long end of the zoom. The Canon HS System - a 16.1 megapixel high-sensitivity CMOS sensor and DIGIC 6 image processor - provides excellent detail and color in low light. Smart AUTO makes high-quality imaging easy in any situation, and Intelligent IS keeps shots clear and steady. Best of all, built-in Wi-Fi lets you transfer images and video directly to select social networking sites, mobile devices and your computer, so you can share from almost anywhere. Plus simply touch the camera to a compatible Android device using built-in NFC (Near Field Communication) for easy wireless connectivity.